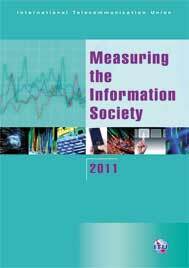 The 2011 edition of Measuring the Information Society features two benchmarking tools to measure the information society: the ICT Development Index (IDI) and the ICT Price Basket (IPB). The IDI captures the level of ICT developments in around 150 economies worldwide and compares progress made during the past two years. The IPB combines fixed telephone, mobile cellular and fixed broadband tariffs for around 160 economies into one measure and compares these across countries and over time. The Report also presents the latest global market trends, takes a closer look at fixed and mobile broadband developments and analyses the digital divide among Internet users. The analytical report is complemented by a series of statistical tables providing country-level data for the indicators included in the two indices. Order below the full report, which includes Annex 5's tariff data, not otherwise available.